Play out epic scenes from Star Wars: Episode VI Return of the Jedi and other thrilling space battles with the B-wing™! Rotate the cockpit so the pilot always has a clear view ahead. Rev up the 4 huge engines to power through the galaxy and fire the spring-loaded shooters to repel Imperial attacks. Adjust the wings from the iconic cross shape for flight or landing mode. Includes 3 minifigures with assorted weapons and an accessory: Ten Numb™, Gray Squadron Pilot and General Airen Cracken™. This comes down to 15.61 cent per brick. 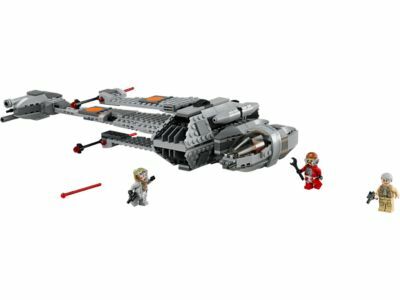 The B-Wing™ (75050) Lego set is no longer directly available from the sites below. However, 3rd party partners of these sites might still have the set available. Alternate description Defend against Imperial attacks with the B-wing™ with rotating cockpit, 4 large engines, 2 spring-loaded shooters and foldable wings.